It’s been more than a decade since I last ate veal. I stopped when I learned how cruelly calves are treated in anticipation of turning them into veal. I won’t judge you if you eat veal because everyone’s food choices are personal, but I decided veal wasn’t for me. It’s only in the past few years that I have come to the realization that in order for animals to give milk, they must have babies first. Female babies have value in growing a dairy herd. Male babies, not so much. This is why lamb and veal have made it into our food system. With veal, conventional practice has been to crate the calves to prohibit exercise and normal muscle development in any effort to create a highly tender and white meat. This is what caused me to drop veal from my diet. At a winter Farmer’s Market, I was talking to a local cheese maker while sampling her wares. When I noticed a sign on the table advertising veal for sale, I shifted the conversation in that direction. At Lawton’s Family Farm, the excess calves are raised in fields alongside the other grass-fed cows raised for beef. This is also known as “rose veal” because the color is pink, a natural result of the exercise and muscle use from gamboling in the fields. This was veal I was open to trying. I bought the last chop, stashed it in the freezer, and forgot about it. 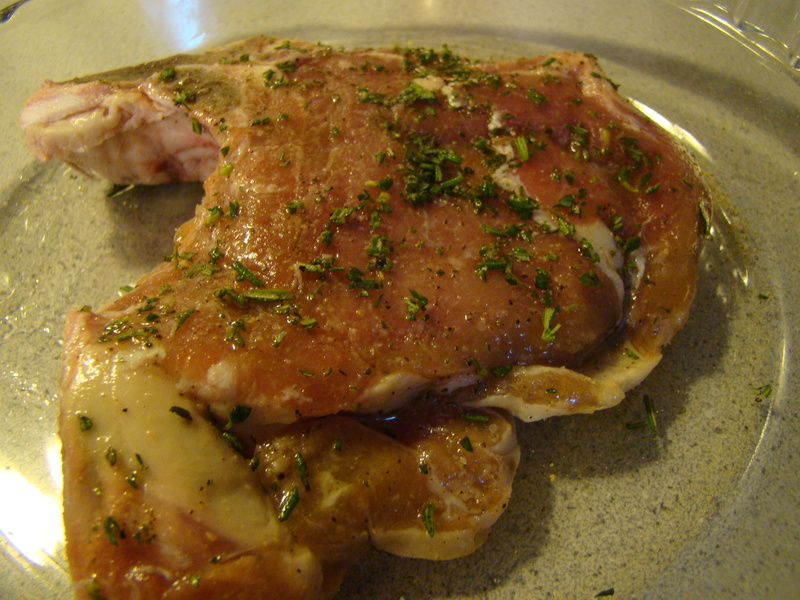 When I saw this week’s recipe for French Fridays with Dorie would be Veal Chops with Rosemary Butter, I remember the lone chop in the freezer. Rather than substituting another kind of meat, I gave it a try. I only make compound butters sporadically, when a recipe calls for a specific blend. I don’t know why they aren’t part of my regular pantry. I made half the recipe because I knew I was cooking just one chop. Fresh rosemary and thyme (for my garden!) were mixed into softened butter before adding a pinch of salt. I used Maldon salt and the flakes gave it a great texture when I tasted it straight. The chop is rubbed with olive oil, rosemary, thyme, salt and pepper. The chop should be seasoned for at least an hour, and up to a day, ahead. I didn’t read the recipe carefully before I set out to make dinner, so 15 minutes is all it got. Olive oil is infused with garlic and more rosemary in the pan before searing the chop for two minutes on each side. Then, the pan is deglazed with white wine and chicken broth to make a sauce. (I didn’t have any broth readily available, so just used water and salt.) The sauce is drizzled over the chop before topping it with a few dots of the rosemary butter. The preparation was delicious, and so was the veal. One of the things cooking from this book continually teaches me is indoor ways of cooking meat. This technique is a winner. It might seem simple, but I honestly have never pan-fried meat outside of recipes in this book. Howard and I shared the half-pound chop with a generous serving of roasted potatoes and an arugula salad on the side. I will try to remember to make this with lamb and pork shops over the winter. I would make a perfect meal for company. My favorite part of this particular recipe was the rosemary butter. I accidently cut up a little more than I needed to top the meat. I’ll admit to eating a few dots plain instead of throwing it out. I’m thinking of making some biscuits or picking up some dinner rolls as a vehicle for the leftover herby, salty spread. It was amazing. 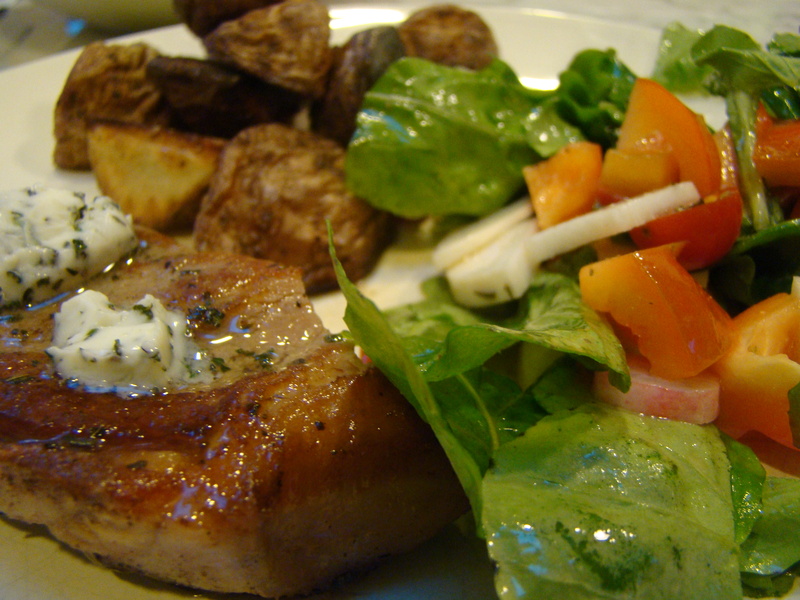 If you want to read about other interpretations of chops with rosemary butter, check out the Dorista links here. The recipe can be found in Dorie Greenspan’s book Around My French Table. Happy Friday! I can’t believe that next Friday I’ll be in Seattle and will meet about a dozen of you in person. Can’t wait!!!! !